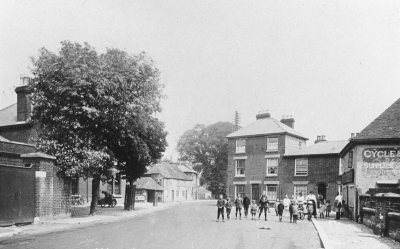 The main road east, now largely unrecognisable for the way it has grown. The urban sprawl makes it difficult to spot the boundary between Fareham and Portchester. It was designated A27 in 1922 and still holds that status today, even though it was detrunked in 1977. Starting at Delme Arms Corner, which takes its name from the pub at the junction (formerly Charringtons/Delme Lounge), which itself is named after Peter Delmé, who between him and his family owned Cams Hall for nearly a century in the 1800s. Once a crossroads, where Cams Hill flowed on to East Street, crossing Wallington Shore Road and the wide entrance to Cams Hall, the area is now overshadowed by the modern A27, with only the suspect kerblines and the isolated section of Wallington Shore Road providing evidence of the junction. Cams Hall is thought to be a 13th Century manor house that has been extensively modernised, but was passed between owners in the 20th Century, and in 1953 an explosion at the naval storage yard left it heavily damaged and it fell in to disrepair. The death of the next leaseholders, the Hill family who had intended to make it a caravan park, as well as further vandalism saw it listed as derelict in 1989, but a restoration programme beginning in 1991 saw it refurbished to become a business park. It is from here that the name Cams Hill, used by the road past the site and the adjacent school, was taken. In the mid-1960s a small portion of North Park, where the Hall is built, was sacrificed for the construction of the new A27 Cams Hill, taking it away from the narrower, uphill climb and the 19th Century cottages. It had been used to host funfairs. The offline improvement in theory allowed a lot of woodland to be saved, although how much actually was isn't clear, it probably later fell naturally. Many of the trees here had been planted as part of a project in 1927 to spruce up the area. There is some confusion over which road is what: it appears that the old road was originally Portchester Road, and then the name Cams Hill stuck. The new road is also known as Cams Hill but only between the lights - the rest of it is referred to as Portchester Road. Beyond the old cottages by the pub is Downend Dell. This was a couple of properties which became the full street known as The Dell in the 1980s. Here a gap is provided for the old road to meet to the new one. The wonderfully named Paradise Lane is a historic lane running up to Military Road, once serving Downend Farm, which was on the eastern side right up against the railway line, and onwards towards Boarhunt. It was never much more than a track. In the corner of its junction is the Downend Cottage. Speaking of Paradise Lane, it's worth mentioning that beyond the railway bridge, the road roughly follows an old railway line, which went from the viaduct to Fort Southwick. All traces of it are long gone. Cams Hill's tree-lined journey continued. After a gap, the next few properties were Nursery Lodge and Downend Lodge, which formed the entrance to Downend House, owned by Charles Osborn. The access to this survives as the driveway to The Lodge, 30 Cams Hill. 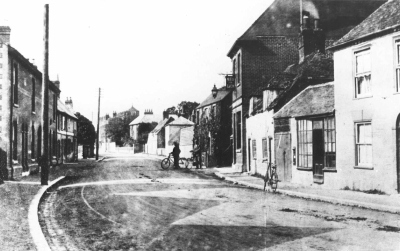 In 1950 the land south of Downend House was sold to create The Ridgeway and St Catherines Way, and a few properties on Portchester Road itself. Most of The Ridgeway and The Causeway (around the farm) didn't follow until a few years later. The house itself wasn't demolished until even later, becoming Alum Way. At St Catherine's Way, the new road bears north, crossing the path of the old one. In 1958, Fareham Girls' Grammar School (becoming Cams Hill mixed school in 1975) was built on the land known as North Park, accessed from a long driveway off of Birdwood Grove. In the 1990s some of their land was sold off to create Shearwater Avenue. East Cams Close takes up the land formerly occupied by East Cams House, which formed part of the East Cams Farm. There would have been a tollgate here. Opposite, a row of 1940s houses is set back from the road. Despite it aligning perfectly with other sections of old road, it looks like this one was misleadingly added. Another field was sold to create Cams Bay Close in the 1960s. The Thicket and The Spinney were originally built to house prisoners of war (camp E251), many of whom later became integrated in to the local community, with today's housing being developed after 1965. 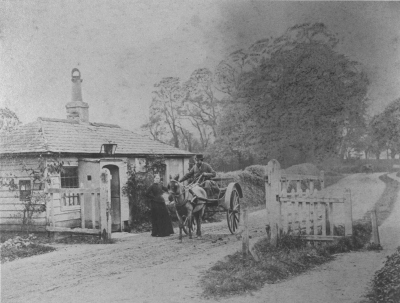 Moving along the road, the earliest houses on the road itself arrived at the start of the 20th Century. In the 1980s, Condor Avenue was built, with the associated roundabout. It wasn't until 2005 that five old houses on large plots of land were demolished to make way for Oysell Gardens. Cams Bridge (accessed from The Thicket) leads to Winnham Farm, and formerly served a gravel pit and a piece of land known as Cams Coppice. The main road through here is wide, but appears to have formed with little encroaching on to private land. Eight houses east of Beaulieu Avenue were the West End Farm, the land from which allowed the road to be upgraded to a dual carriageway, with the eastbound side being the old road. This was one of the proposed crossings of the M27 in the 1950s. Cornaway Lane went down to the Little Wicor Farm on the corner, with the larger Wicor Farm at the end of that road, by the Wicor Lake and Wicor Marsh. The road was once known as Fareham Road, but this name appears to have been lost as the Fareham boundary became less pronounced. It passed through a crossroads, with a stub in the middle of the roundabout being a remnant of this. The smaller, parallel West Street isn't actually the original: it was built with this area in the 1950s as part of the post-war development of the south. This moves in to Portchester village, where the West Street bypass was built in the early 1970s to relieve the streets. Previously, the old road was Main Road, but it was renamed during early 20th Century redevelopment. The original line, crossing Castle Street was a poorly reputed crossroads, which can still partially be seen in the alignment of the pavement, past Portchester Farm (later Murrills, then an engineering works), where it went on to become East Street and later Cosham Road (now Southampton Road).